One of the most recognized authors of Russian pictorial history is A. P. Ryabushkin in the last time of his life, despite the fact that he was very sick, felt a strong inspiration. During this time, he wrote a series of beautiful canvases that filled up the picturesque treasury of the world. One of them is “Sunday Day”. This work amazes the viewer with its amazing simplicity. 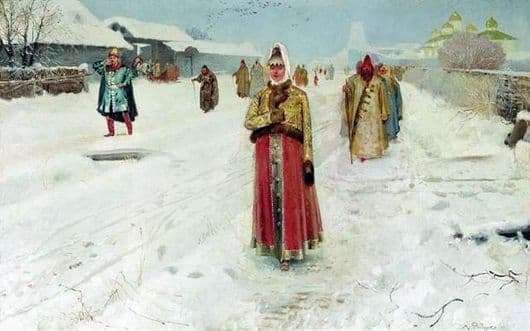 With a snow-covered street of ancient Moscow, a graceful and easy walk is a young lady. As if it hovers over giving away blue snow. Literally in all its movement, incredible lightness is felt, besides, this impression is reinforced by a fur coat and a luxurious braid on the shoulder, which is naturally swaying from the movement. The slender figure of a girl, who proudly raised her head, lowered her eyes modestly, doesn’t even look around, appears clearly on a snowy background. The high headdress on her is like a crown. The pale skin on the face is slightly covered with a blush, but in her posture and even in the face there is a cheerful mood, ready to burst into laughter. The girl is dressed in a crimson-colored fur coat. On the canvas is dominated by very juicy and bright colors. Even in the clothes of passers-by who admire the beauty of the girl, they clearly stand out. But it does not violate the inner harmony in the picture. The harmony is also introduced by the landscape background of the picture. The street is almost empty, except for a few passersby. Numerous traces of the sled runners are visible on the silver-blue snow. In the background is a white stone church, houses and trees covered in snow. Their static character perfectly emphasizes the girl’s light and striving gait. Ryabushkin was able to perfectly convey the process of its movement on the canvas. There is no static feeling at all, and there is only one girl in the foreground.